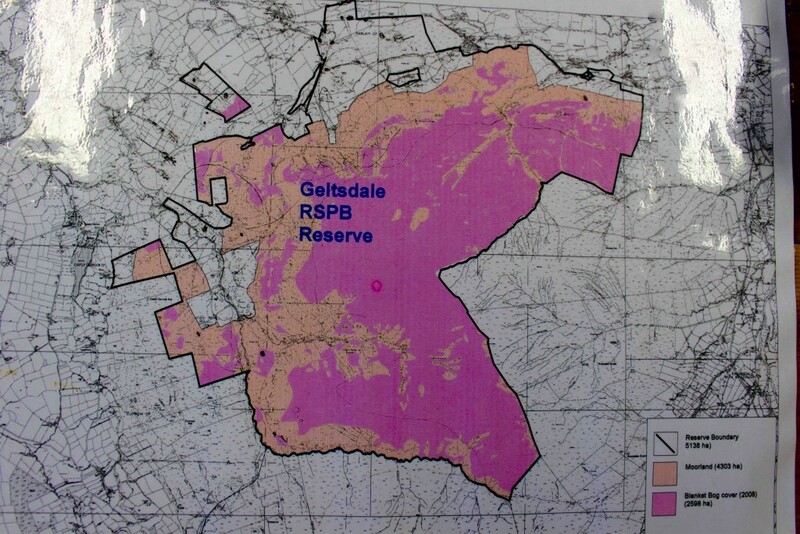 The RSPB’s management of Geltsdale reserve in Cumbria shows that this is not the case. For the last 17 years, the RSPB has managed Geltsdale with conservation and restoration measures that include heather mowing, mixed grazing, rewetting (through blocking 150 grips), and tree planting. 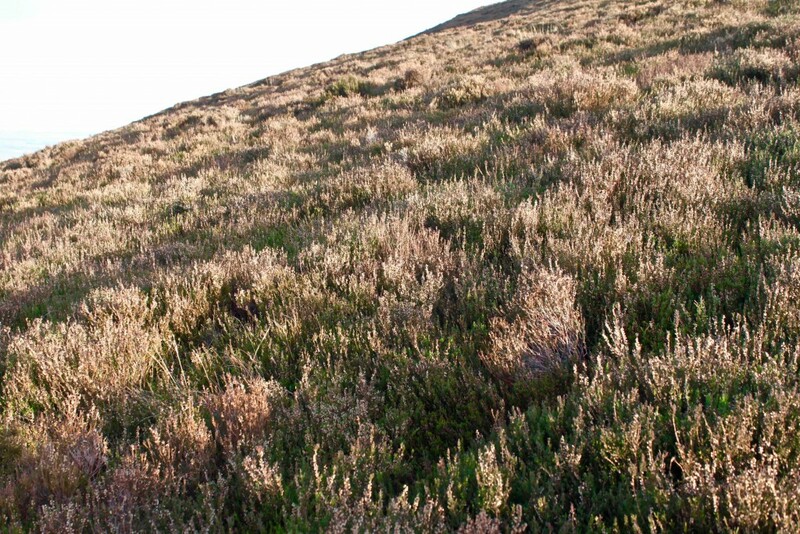 They stopped burning heather altogether in 2009. Previously, Geltsdale had been intensively grazed by sheep, and had also been intensively burned and drained. To find out more, Calderdale Slow the Flow, Treesponsibility and Ban the Burn visited Geltsdale and were given a guided tour by Steve Westerberg, the site manager. 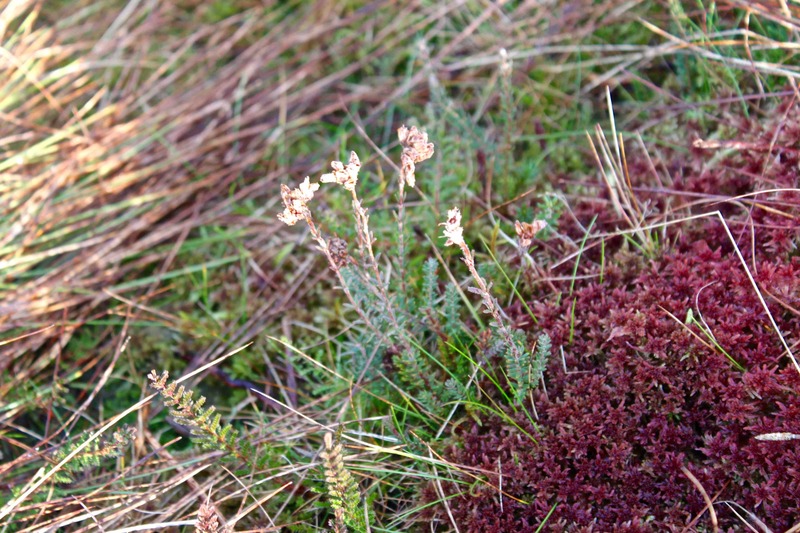 The RSPB aims for recovered healthy blanket bog: 1/3 sphagnum, 1/3 small shrub, 1/3 cotton grass, and increased wildlife diversity. The results are encouraging. 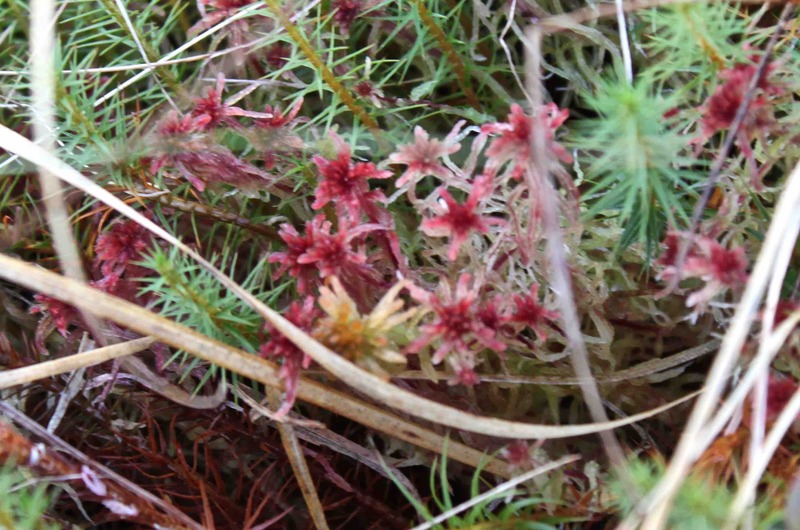 There is a lot of sphagnum spreading. Small shrub density is recovering (from a very low base, due to previous mismanagement), and a variegated habitat that is good for curlew has replaced sheep sward. Steve told us that since the RSPB started managing Geltsdale, they have reduced sheep numbers considerably and have put in 150 cattle, which are free range. Cattle are quite selective about what grass they eat so when they graze, they leave patchy areas of grass which benefit many birds, particularly black grouse and curlews. The result is a more a varied sward, and with the numbers of stock there’s a chance for other plants/flowers to grow. 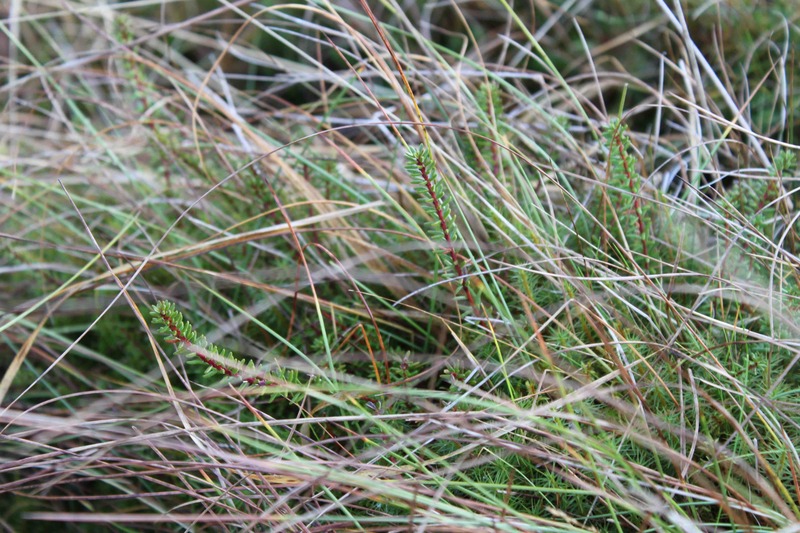 Once the RSPB had replaced sheep with cattle, first molinia grass came back, then lots of sphagnum of many varieties, and small shrubs such as crowberry. This variegated, valuable habitat is good for curlew. 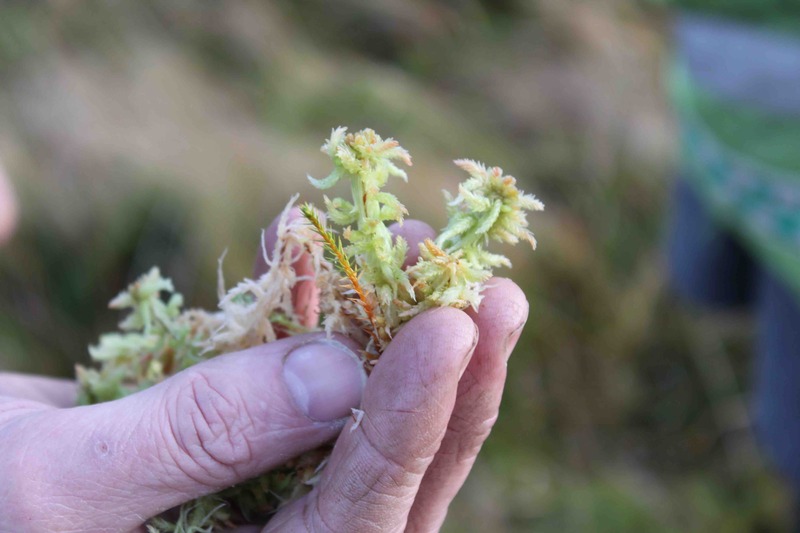 Now sphagnum is spreading in this area – a very slow process, but it will happen on its own. 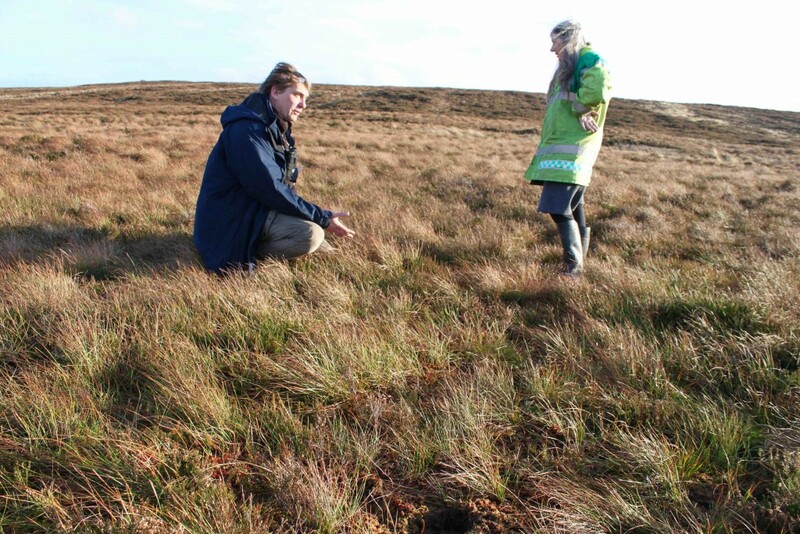 Steve told us that the further south you go in the Pennines, the more likely it is that sphagnum reintroduction will be necessary. 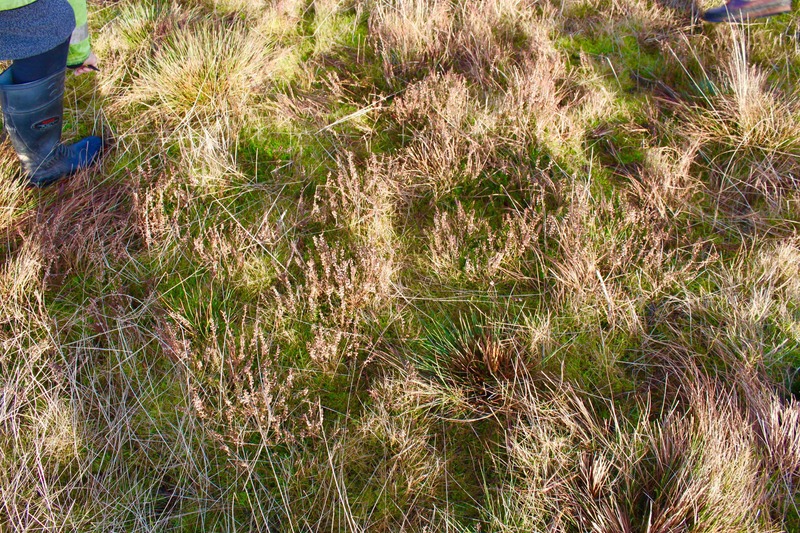 Across the valley from Geltsdale is a raised mire with 6m+ deep blanket bog. It is now a source of sphagnum that is taken for regeneration. In the photo below, the raised mire is the brown area in front of the Sitka plantation. 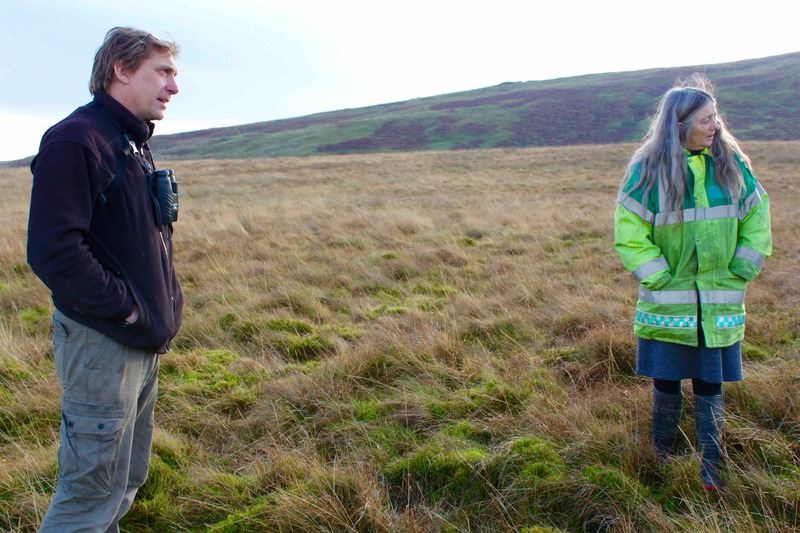 The RSPB are hoping to use pulse grazing in areas of habitat that like change. They have planted 110K trees, and are planning to put cattle into bits of it for a short time to hit the area hard and then move to another area. This will involve up to 8 years of no grazing in some areas. This practice is good for black grouse. On Geltsdale, the RSPB are doing quite a lot of natural flood management. Originally, this was to improve the habitat through drain/grip blocking. They have tried various grip blocking techniques. The most effective was stuffing the length of drains with baled heather that had been cut on the site. This was the most expensive option – but the most effective. The RSPB at Geltsdale uses 2 local contractors – 1 for heather cutting, another to bail heather at different densities appropriate for grip blocking. The heather mowing costs £400/day and is done for 20 days/year. 30-35 ha/year is mown. One of the local keepers on the neighbouring moors is now buying mowing tractors and flails, so it looks as if they are convinced that this is the way to go.. The RSPB have been cutting heather from the start, which has allowed them to monitor the difference in grow back, but there was no baseline monitoring to show what’s resulted. They would consider innoculating sphagnum a few years after the heather cutting. We climbed the hill to an area of dry heath where the heather has been cut. Part of the heather cutting regime at Geltsdale is targetted for golden plover – one of the protected species in the area. The RSPB are working to get the habitat right for sustainable populations of diverse species including windchat, golden plover, curlew and black grouse. On the back of habitat change, black grouse numbers increased from 4 lekking males in 2000 to 59 in 2014 – without the need for much predator control. We were interested in the RSPB’s trial management experiments to tackle and reverse the decline in curlews and golden plover. 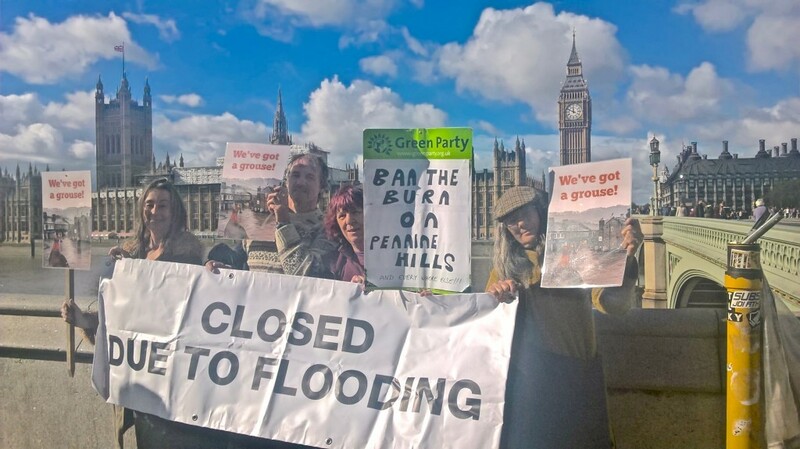 This is a nationwide problem – but you wouldn’t have guessed that from the Ban Driven Grouse Shooting petition inquiry in the House of Commons. MPs seemed to blame the decline in curlews at on opponents of grouse shooting. Catherine McKinnell, Labour MP for Newcastle North, referred to a Moorland Association study that found a substantial decline of in the numbers of hen harriers, golden plover and curlews in the Berwyn special protection area RSPB reserve in Wales after grouse shooting was stopped there. Back in Geltsdale, Steve told us that grouse moors do favour curlew. And habitat change and loss has led to a big increase in generalist predators such as foxes/crows, that threaten curlews and golden plover. 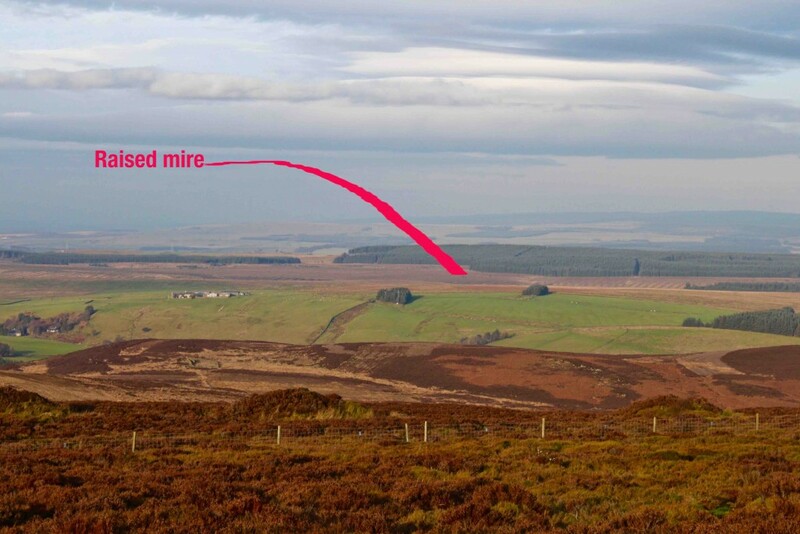 At Geltsdale, there is a pilot area with increased predator control and mowing compared to a control site where they’re not doing this. This entry was posted in Ban the Burn News and tagged cattle grazing, Geltsdale, heather cutting, recovering blanket bog, RSPB, sphagnum regeneration, upland management by jenny. Bookmark the permalink.